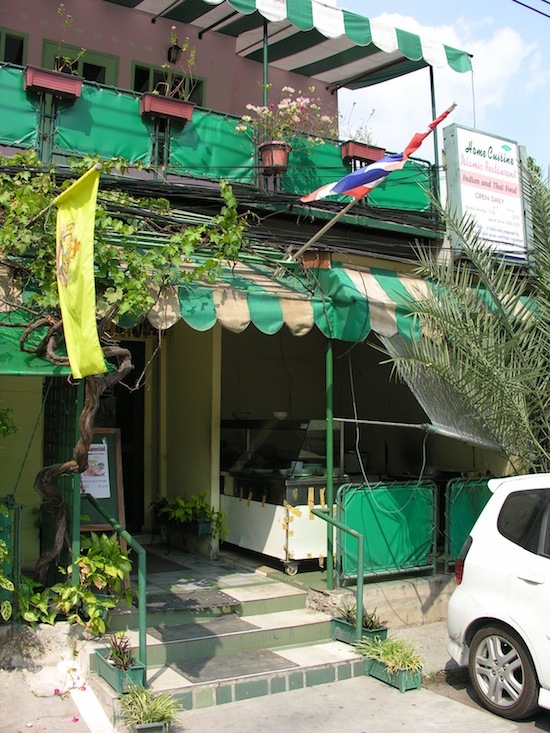 We’ve passed Home Cuisine Islamic Restaurant near Haroon Mosque on Charoen Krung Soi 36 several times, and as nearby Muslim Restaurant has long been a favourite of ours, we thought we’d see how Home Cuisine compares. While far from elegant, the restaurant aims for a classier ambiance than what you’ll find at no-frills Muslim Restaurant. 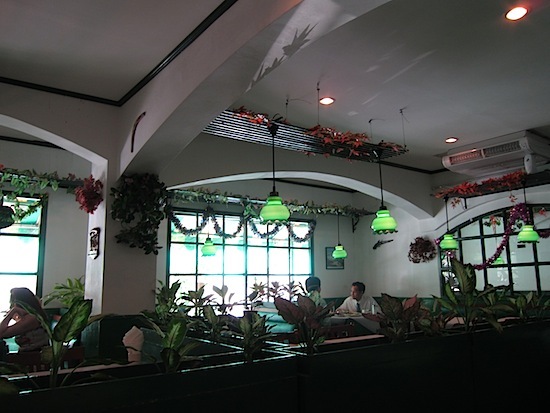 The small air-con dining room has a very green theme going with green lamps hanging over green booths surrounded by green potted plants. Antique revolver pistols mounted on the walls are an interesting touch. Service is quick and attentive. While comfortable, the atmosphere reminded us of the Olive Garden with a hangover, but we’re fine with tacky decor if the food is good. Home Cuisine offers an extensive menu with popular dishes pictured to help narrow down the choices. Though Indian names like masala, dhalcha, biryani and dhal dominate the first couple of pages, the menu’s entire second half is devoted to Thai-Muslim dishes and several Thai staples like green curry and tom yum. Indian-style unleavened breads, homemade yoghurt, fresh fruit juices and desserts like “milk jelly” and lasmalai rice pudding are also available. A Hainanese chicken rice special was on offer (not sure if it was plain old Thai-style khao man kai or something truly “special”), and the “stuffed eggs with sweet and sour sauce” piqued our curiosity. But this was our first time here, so we had to dive in with the house specialty — biryani rice with chicken (85 baht), known as khao mok kai in Thai. We also tried the mutton (goat) masala curry for 95 baht. 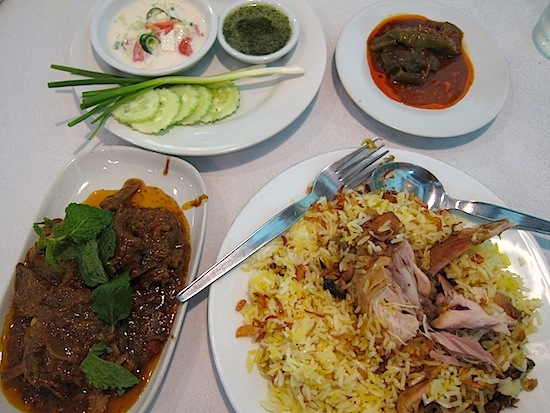 Most dishes cost between 70 and 100 baht, a solid 30 percent more than at Muslim Restaurant, although portions generally seem larger at Home Cuisine. It’s best to come famished. All biryani dishes (mutton is also available for 150 baht) come with complimentary sides of pickled okra or eggplant with chilli oil, a cooling raita yoghurt sauce with bits of tomato and cucumber, and a green sauce that looks like what’s commonly served with Thai-style khao mok kai but was far sweeter than we were expecting. With bits of fried onion and tender roasted chicken breast that fell off the bone, the massive plate of rice cooked with turmeric and chicken stock was hearty and delicious. We hardly touched the sweet green sauce but found the raita and pickles to lend a welcome boost of flavour. The mutton masala was oilier than similar dishes we’ve tried at Muslim Restaurant and consisted of more bone than meat. Still, the slow-roasted sauce was well-seasoned and spicy, and we appreciated the mint leaf garnish to offset the richness. Owing not only to the portions but also the heavy amounts of oil involved, we felt as though we’d gained a kilo or two while strolling back to Charoen Krung Road after the meal. If you’re on a diet, avoid this place like the plague. A little more green for good measure. Though we’d need to try some of Home Cuisine’s other selections before making a definitive judgment, as of now we’re still partial to our old standby for Muslim food. While very tasty, our meal at Home Cuisine didn’t leave us daydreaming about the food in the way Muslim Restaurant consistently does, and we love how it’s possible to try out several dishes at the latter without spending 500 baht or more. With that said, Home Cuisine is a great choice if you’ve got a craving for biryani rice, and overall it offers a more relaxed and comfortable dining experience. To get here, take exit 3 out of Saphan Taksin BTS station and then hang a left on to Charoen Krung Road. Walk for about half a kilometre and turn left down Soi 36. You’ll see the green and white awning of Home Cuisine a short way down on the right, immediately across from the French embassy. After lunch, you might check out the area’s antique art galleries, Assumption Cathedral or Wat Yannawa.